On September 5, 2017, the Trump administration announced the end of the Deferred Action for Childhood Arrivals (DACA) program. Here is some information and a collection of resources for DACA recipients, their families, and any who will be affected by this announcement. This information is not intended as nor is it a substitute for legal advice. We will be updating this page with any new developments, so please check back in case there are any changes. On January 9, 2018, a federal district judge in California issued a nationwide injunction, followed by a second nationwide injunction issued by a federal district judge in New York in February. These orders mean that USCIS has to continue to accept DACA renewal applications while these lawsuits are being litigated, which effectively blocks the Trump administration from ending the program on March 5. The Justice Department also requested an immediate review by the Supreme Court, but they declined to review the injunction until an appellate court has. USCIS is accepting renewal applications. If your DACA expired on or after September 5, 2016, you may submit a DACA renewal application. For more information, visit informedimmigrant.com. If your DACA expired before September 5, 2016, you must fill out the application as if you were applying for the first time. If you had DACA at some point, and the government terminated your DACA, you can also fill out a DACA application as if you were applying for the first time. If you submitted a renewal request between September 5 - October 5, 2017 and received notice that your application was rejected because it wasn't received on time, you may be able to resubmit your application. To see if you qualify, visit National Immigration Law Center. Your permit is otherwise valid until it expires. To determine your expiration date, look at the I-795 Approval Notice and the bottom of your Employment Authorization Document (EAD). You can no longer receive permission to travel abroad through Advance Parole. Any pending applications will not be processed and DHS will refund your fees. Your Alabama driver's license will expire on the day that your permit expires. You will not be able to attend a public university in the state of Alabama if your permit expires. However, most states (excepting Alabama, Georgia, and South Carolina) do allow students to enroll in public colleges and universities, regardless of immigration status. Anyone regardless of immigration status is able to receive healthcare treatment in all states at emergency rooms, community health centers, free clinics, and public health centers. If you believe you or someone you know has had their DACA unlawfully revoked, contact the ACLU at DACArevoked@aclu.org. If you submitted your application on or before September 5, 2017, USCIS will still process your application. If you have never had DACA before, you may not submit an application for DACA now. 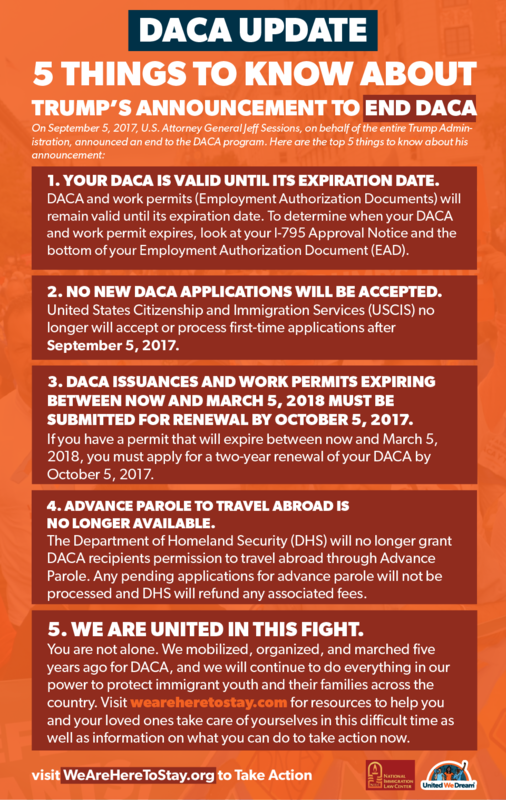 Only people who had DACA at some point in the past can submit an application to renew their DACA.